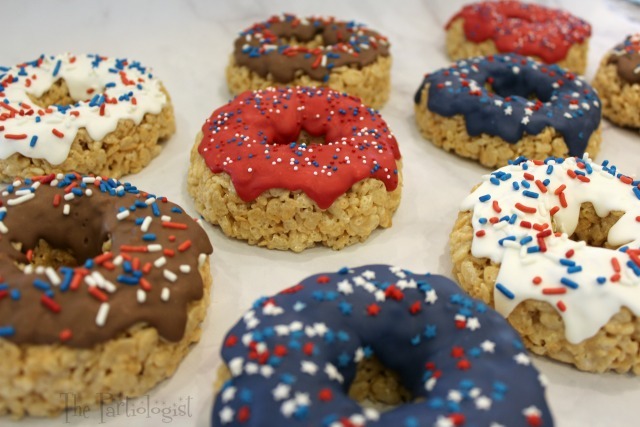 The Partiologist: Rice Krispie Donuts! Oh No! I missed national donut day. I miss national donut day every year... I guess I've really only missed it the last couple of years, before then, I didn't even know national donut day existed. I decided to celebrate now, if I wait until next year, chances are I'll miss it again. I mean, do people put it in their calendar? How do they remember? I know I'll remember these donuts and I hope you do too, it's never too late to celebrate. 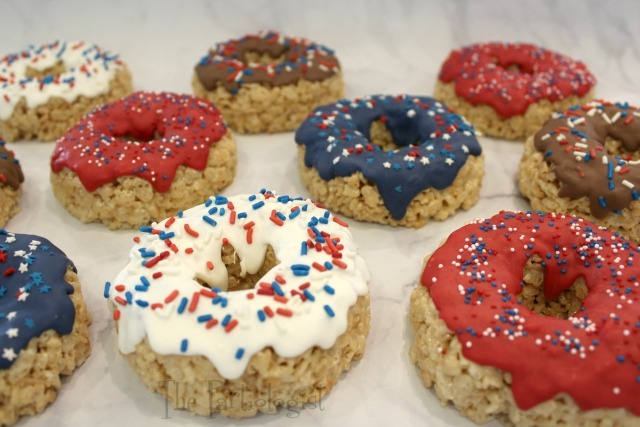 Not just a donut, a donut to celebrate the Fourth of July! What fun to wake up to these, right? They are made with Rice Krispie cereal, which is a breakfast food. And a donut for breakfast is perfect. And this is the only kind of donut I am able to eat. Over 20 years ago I had a day where I ate seven donuts, nothing else, just donuts. Then I realized I have a problem with donut portion control. So I decided I would give up donuts and I haven't had once since. Since these are Rice Krispie Donuts, I can eat these. I didn't give up Rice Krispie Donuts. Yet. We'll see how it goes when I start eating them. Anyway, I hope you haven't given up donuts in any shape or form, because you need to make these for your friends and family. 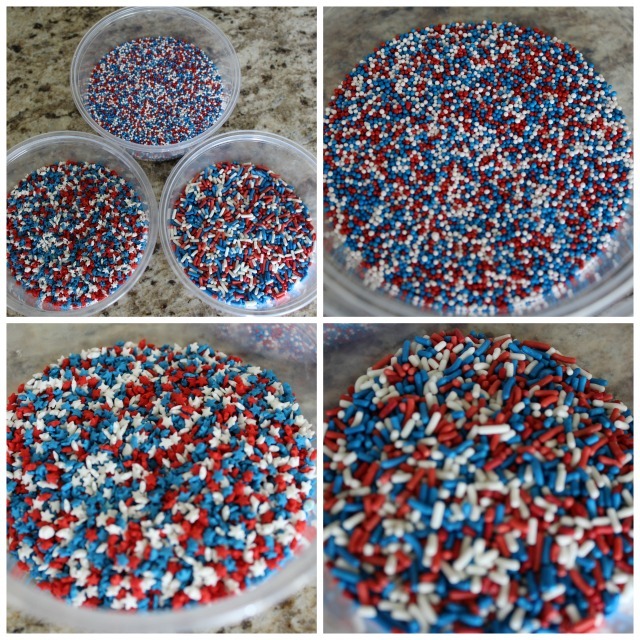 The patriotic sprinkles include, dragees, stars and jimmies. Run your fingers under cold water (this helps prevent the RKT from sticking) and grab a glob of the cereal treat. 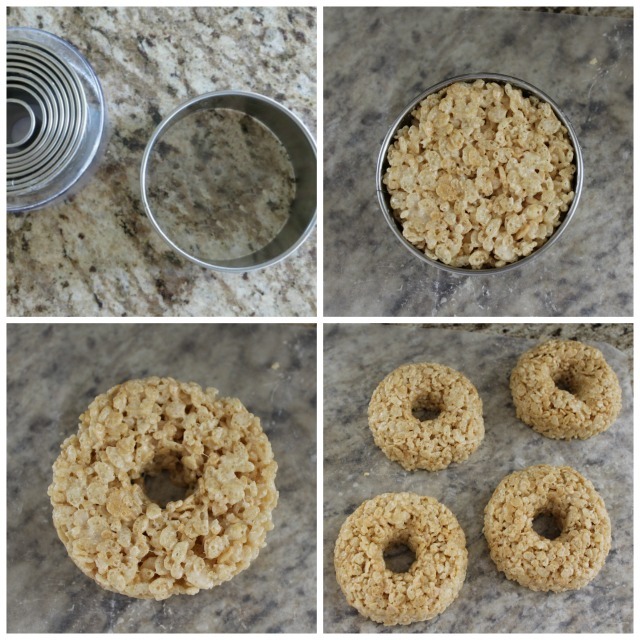 Press the RKT in a round cookie cutter. Remove it from the cutter and with your finger, press a hole in the center, gently shaping the RKT into a donut. Continue shaping the donut as if you were using a pottery wheel. Not that I've ever used a pottery wheel, but I imagine it would be the same, turning and turning. 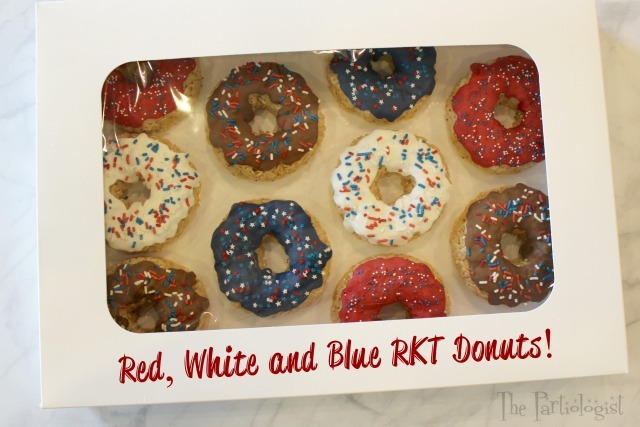 Place the RKT donuts on parchment paper. The topping of choice is chocolate. Melt, candy melts, chocolate chips, any kind of chocolate. Spoon a little on the top of the donut and let drip down the sides. 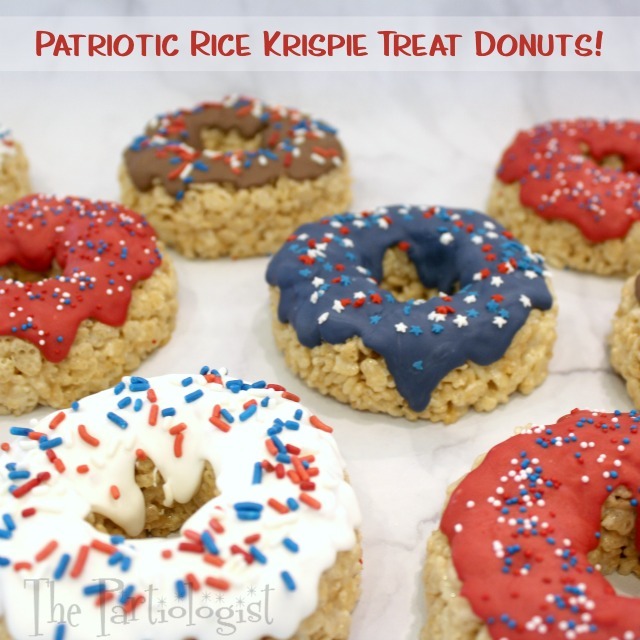 Sprinkle with red, white and blue jimmies. You can make them all chocolate, with any color sprinkles, or you can add red, white and blue candy melts. Now they are ready for your Fourth of July celebration. And I will be ready for the next National Donut Day! Box them up and they're ready to go. Boom! It's everything you need to get fired up for the fourth! Sooooooo fun!!!! Thanks for sharing! Such a cute idea. Who doesn't like RKT? Everyone probably knows the recipe but just for your information I tried to click where you said the recipe was and it doesn't work...it's not a "clickable" "HERE"